Here at Pinto Gold, we’re proud to carry some of the most reputable brands in the high end jewelry, handbags and watch industries. 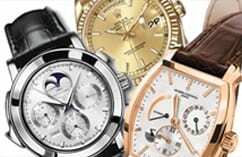 We search for brand name items that maintain their beauty and value long term, like used Rolex and OMEGA watches, used Louis Vuitton and used Chanel handbags, and more. Brands like Tiffany & Co. and Cartier not only keep their value but appreciate over time, and continue to be well sought after for years to come. To learn more about the great brand name products we have in store, come visit us at Pinto Gold today!